This thin section image of NWA 5903 provides viewers with an abstract painting created by nature. 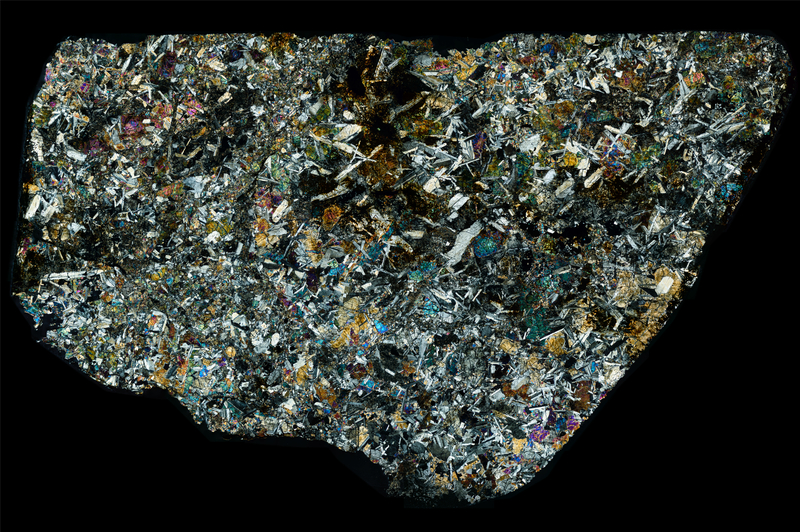 To look at a thin section of any rock under cross polarized light is to view the emergent features of mineral formation. Sextillions upon sextillions of atoms all interacting! It is fascinating to observe how matter crystallizes in various geometries and how this crystallized matter acts under polarized radiation. The eucrites are always wonderful to view this natural process, and NWA 5903 does not disappoint. The calcic plagioclase and exsolved pyroxene are mostly what give this image its incredible beauty.